you get to pick a FREE item from the Sale-a-bration brochure. CHECK OUT THE CHOICES . . . its so hard to choose - I love each one of the options and it always seems I want them all! or invest in something from your Wish List. Hostess Rewards (as long as your order is not part of someone else's party order). Hostess Rewards are 10% which means an additional $15 of product for free.
. . . During Sale-a-bration, orders over $250 earn an additional $25 which translates into $50 of free product plus 5 Sale-a-bration choices. Is this the time to splurge on yourself?
. . . If your order is between $100-$150, consider purchasing your items as a "Starter Kit". The kit allows you to choose up to $125 of product and pay only $99, and that includes the shipping! 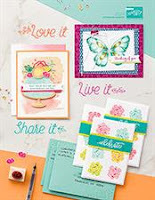 And during Sale-a-bration you also get 2 FREE stamp sets of ANY price.
. . . This is Stampin'Up's! NO OBLIGATION Starter Kit. 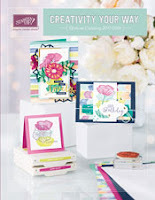 StampinUp! loves their hobby demos and strongly supports having you "join" the company this way. There is no obligation to sell, no obligation to buy more and no penalty to drop. And if you've previously joined and dropped you can join again. Sale-a-bration offers you lots of fun new product as well as lots of ways to save money.